Weird Moon of the Solar System: Europa The Ice Moon ?! Like its jovian sibling IO, Europa is experiencing many changes, but it’s devoid of fire. The satellite is only slightly smaller than our Moon, and water ice coats its surface. 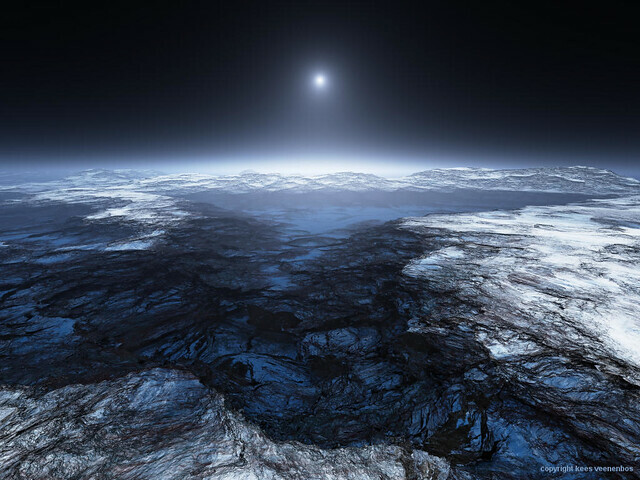 Deep down, though, it is not as cold as it looks: Europa is not frozen solid. Most of the surface features on the satellite have formed in the past 100 million years. Compared to Earth’s Moon, which has remained essentially unchanged for billions of years, Europa’s landscape is relatively new. The smooth surface is broken by stress cracks and shattered sporadically by meteor impacts. Huge swaths of the europan surface look like broken glass molded together with clear glue. This “chaos terrain” may result from upwellings of new ice deposited in mammoth sheets that shift, slide, and collide. The tug of gravity from Jupiter that creates Io’s volcanoes also warms Europa’s interior. Internal heat drives this chaotic change on the moon’s surface and led astronomers to speculate that liquid sloshes around underneath. The ice-covered satellite may harbor an ocean of liquid water more than 60 miles (100km) deep that melted because of the tidal heating. If this proves true, Europa would contain more water than Earth. And where there is water — especially water that contains salts — there could be life. Many scientists consider Europa to be a prime candidate to host life within our solar system, but many questions remain. How much water is on Europa? Is the surface ice old or new, thick or thin? In December 2013, scientists led by Lorenz Roth of SwRI created a buzz when they reported that the Hubble Space Telescope had found evidence of plumes of water vapor breaking through Europa’s icy facade. Perhaps the ice is thin enough to allow life to flourish in the europan waters. 10 Need-To-Know Things About Europa 1. If the sun were as tall as a typical front door, Earth would be the size of a nickel and Europa would be the size of the dome on the back of the nickel. 2. Europa is a moon that orbits the planet Jupiter. Jupiter is the fifth planet from the sun at a distance of about 778 million km (484 million miles) or 5.2 AU. 3. One day on Europa (the time it takes for Europa to rotate or spin once) takes about 3.5 Earth days. The length of Europa’s day is the same as the amount of time it takes Europa to orbit Jupiter. Jupiter makes a complete orbit around the sun (one Jupiter year) in about 12 Earth years (4,333 Earth days). 4. Like many other moons (including Earth’s moon), Europa is locked by gravity to its planet so that the same side always faces toward Jupiter. 5. 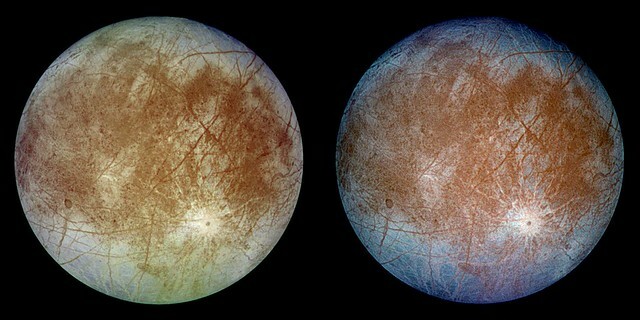 Europa’s surface is mostly solid water ice. It is extremely smooth and crisscrossed by fractures. Europa has an extremely thin oxygen atmosphere — far too thin to breathe. Europa does not have rings. 6. Europa and Jupiter have been visited by eight spacecraft, which have performed flybys. 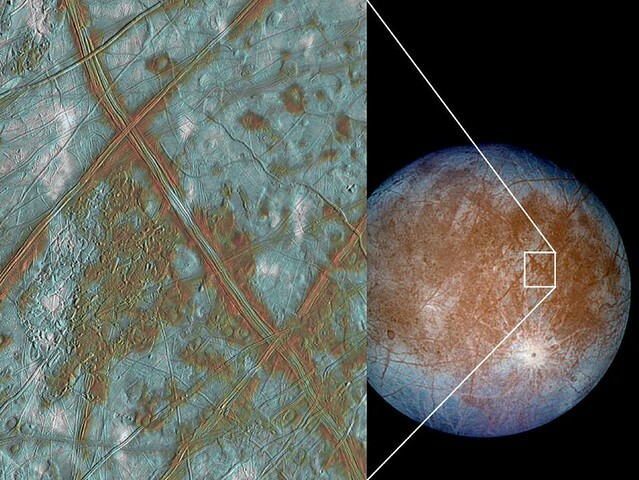 Galileo is the only mission to make repeated visits to Europa. 7. With abundant liquid water, and energy and chemistry provided by tidal heating, Europa could be the best place in the solar system to look for present day life beyond Earth. 8. 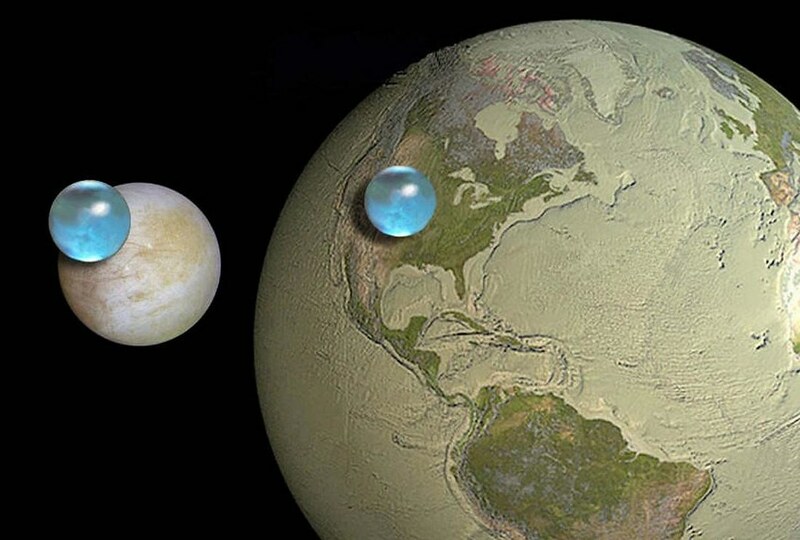 If Europa’s ocean is proven to exist, it would possess more than twice as much water as Earth.